The global single-lead ECG monitors market is expected to witness robust growth and reach a significant market valuation by the end of the year of assessment (2017-2025). The single-lead ECG monitors market was valued at around US$ 344 Mn in 2017 and is estimated to touch a noteworthy valuation of more than US$ 730 Mn by the end of the year of assessment (2025). 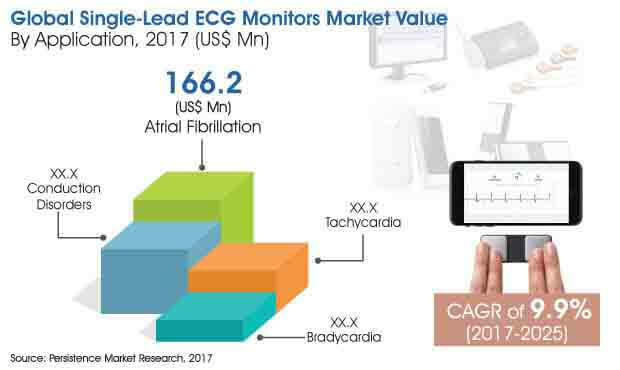 The global market for single-lead ECG monitors is expected to rise at a huge CAGR of 9.9% with respect to value throughout the period of forecast (2017-2025). This growth is pushed by the adoption of single-lead ECGs across the globe in application areas such as atrial fibrillation indications, conduction disorders, bradycardia and tachycardia. Moreover, the presence of chronic disorders and cardiovascular diseases has contributed to the increasing use of single-lead ECG monitors in hospitals, home care and other among end users. Also, the growth of the global single-lead ECG monitors market is backed up with increasing technological advancements in the medical device sector coupled with increasing distribution network and sales channels. There is an increasing prevalence of lifestyle diseases, such as heart diseases, atherosclerosis and stroke, obesity, diabetes type 2, and other diseases associated with alcohol consumption, smoking and high drug abuse. Owing to unhealthy lifestyle and diet, and increasing tobacco use and physical inactivity, heart diseases and stroke are the most common among individuals across the world. Raised glucose level, high blood pressure, overweight, high blood lipids and obesity are the primary symptoms of heart related disorders that can be measured in primary care facilities and hospitals. This has spurred the adoption of single-lead ECG monitors across end users in the globe. Atrial fibrillation segment in the application category is the most lucrative with a high market share and growth rate. The use of single-lead ECGs in detecting atrial fibrillation indications is growing at a significant rate since past years. In 2017, atrial fibrillation indications contributed to the overall sales of single-lead ECG monitors by reflecting a value of around US$ 166 Mn and is estimated to further grow to reach a value of about US$ 390 Mn by the end of the year of assessment (2025). This segment is also poised to register the highest growth rate and reflect a CAGR of 11.3% throughout the period of assessment. Conduction disorders segment in the application area of single-lead ECG monitors is estimated to reflect a market valuation of around US$ 235 Mn by the end of the period of assessment (2025) from a value a bit under US$ 123 Mn in 2017. This segment is the third largest growing segment with respect to use of single-lead ECG monitors and second largest in terms of value generated with the adoption of single-lead ECGs. On the other hand, the bradycardia application segment is expected to show comparatively slow growth in the adoption of single-lead ECG monitors in the coming years. This segment is the lowest in terms of market valuation and growth rate. Shenzhen Creative Industry Co. Ltd.